Barambah produces hand-crafted wines from world class pastoral land in the South Burnett, Queensland. In 1861, Queensland’s first Governor, Sir George Bowen, when he visited the South Burnett declared that it was ‘the greatest pastoral district of the whole colony’. Barambah in the South Burnett has, for generations, exemplified first class produce – its future is first class wine… pure quality, pure Queensland. In order to produce ‘wine without compromise’ we have sourced the best winemaking products and put together the best possible team of professionals. 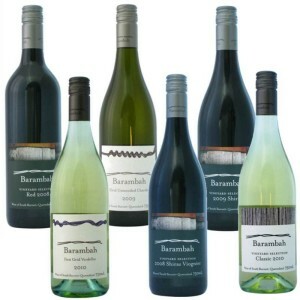 Barambah Wines are available for viewing and purchase from this website. Barambah Wines are also available from selected fine dining restaurants in Brisbane.